It is important to note that SMath has a very good Multilanguage and Regional Setting support. Therefore, the user should take care about the Regional settings. NOTE: See the argument and decimal separator character in the Arithmetic palette. These settings are mainly used in the English part of the wiki. 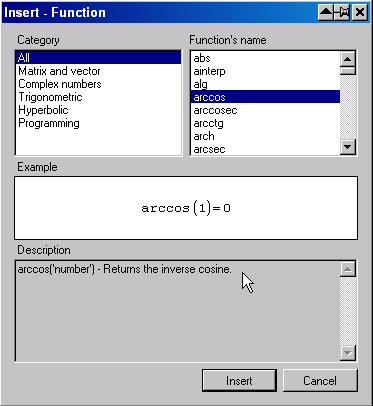 NOTE: There is also a possibility to change the function argument and decimal separators without leaving SMath. You can change it from Tools=>Options=>Interface dialog box. There are Decimal symbol and Arguments separator options. NOTE: The saved files will be opened and the function names will be used according to the chosen style. It is not possible to change the style in the active file - the error (unknown function) will occur. 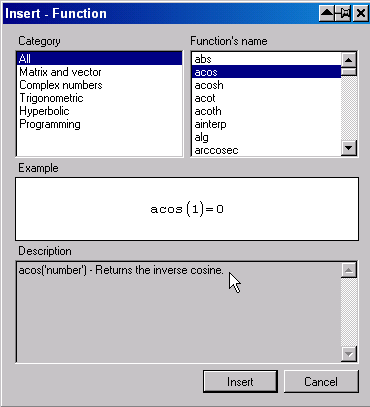 These are some of the built in functions for SmathStudio.